As one of the largest manufacturers in the U.S., Steelcase expends considerable time, effort and funding for their research and development efforts. The research ranges from studies of how and where people work and research on cutting-edge materials and fabrication methods. Work Design spoke with Christine about what their research projects are forecasting for the next five to ten years. One of the most significant changes is the move from “I” space to “We Space” as we shift to a more migratory work day. Companies are moving away from assigned seating, enclosed/one-person offices, and environments that enforce a more sedentary and siloed environment. Their research shows an increased focus on providing spaces for teams to meet and collaborate in a group setting, with secondary spaces for private work and conversations. These spaces are augmented with a place for phone calls or a more formal meeting room with advanced technology to communication with remote colleagues. 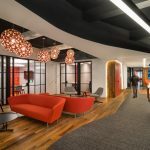 The researchers noted that people were looking for spaces that were not only functional, but could also be inspirational, informal, and provide a setting for connecting on an emotional level. Workspace design has expanded to include consideration of biophilic elements, the quality of light, both natural and artificial, and a more noticeable consideration of personal, physical comfort in a variety of settings. As these trends were evolving, the design experts at Steelcase realized that an expanded product line was needed to furnish these new types of spaces. Adding the element of choice of where and when to work introduced new challenges. The workspace futures research team investigated how people were adapting as these new workspaces evolved to see what was working, and what was not. Their observations provided clues in how to create the new furniture solutions and how to address some of the issues caused by the unexpected behavior in the workplace. The development of the media:scape product line is a perfect example of using design thinking to solve a problem. By observing the behavior in a more traditional room with only one projector, they found that people could easily tune out when one person dominated the conversation. By switching the room configuration of the room, and allowing equal access to the technology, the changing of the table shape, allowed for more eye contact and overall engagement. Additional features of the furniture even allow for sitting or standing postures. These concepts were developed out of observing externally and internally how people were trying to work and managing with the tools at hand. Out of similar observations, media:scape Team Studio was designed, after noting that only people immediately adjacent to a whiteboard would participate in a discussion. Cutting the table in two allows all to have access to the whiteboard and provides additional incentive to join in the discussion. The experiment allowed everyone to get to the whiteboard and it turned the tenor of the conversation. Chris also described the continuing partnership with Microsoft as one way to explore and better integrate advancing technologies with well-designed furniture solutions. Using technology as a continuing way to evaluate how space and equipment are being utilized will most certainly improve the research driving new workplace initiatives. As employers are currently striving to re-evaluate and improve their workspaces to meet the increased need for higher levels of employee engagement, the demand for different types of furnishings is increasing. Steelcase has elected to work with other partners that can provide a carefully curated and complementary offering to their standard furniture lines. The Turnstone and Coalesse products are apparently an alternative to more staid products, and Steelcase has expanded their portfolio by including items from other resources with expertise in areas where they are not as heavily invested. Those offerings include lighting from FLOS and furniture from Mitchell Gold + Bob Williams, BluDot and Bolia to provide options outside the original Steelcase portfolio. Taking this approach to bring in partners to augment the standard product line expands the choices that can be made to bring workspace up to date or meet current needs. Access to these additional products through the Steelcase network facilitates things for both designer and end user to enjoy a broader range of products that offer the opportunity to change things up in the workplace environment. Other partnerships include BluDot, where the full line is now available through Steelcase dealers. This partnership expands on offerings of accessories, accent furniture and seating and occasional tables that increase options for end users to fill out alternative office settings. After talking with Chris, we conclude that Steelcase has taken a holistic approach to intuiting the emerging needs of their clients and customers by careful observation of the multiple transitions in today’s workplace. Article published in cooperation with Steelcase.